Here are the most notable insights into some of the top push notification service providers from our research. It's been over a decade since the technology of 'Push Notifications' was introduced to us and since then we have seen the evolution of various android push notification services and ios push notification services. So today we will be throwing some light on some of the best free as well as paid push notification service providers. This notification feature if optimized correctly can act as a boon for app developers who are facing challenges in retaining their app’s user base. Due to this, we think it is our responsibility to keep our readers up-to-date with the latest trends of the mobile app industry with our 'Reports' featuring some of the best app development service providers on a global level. 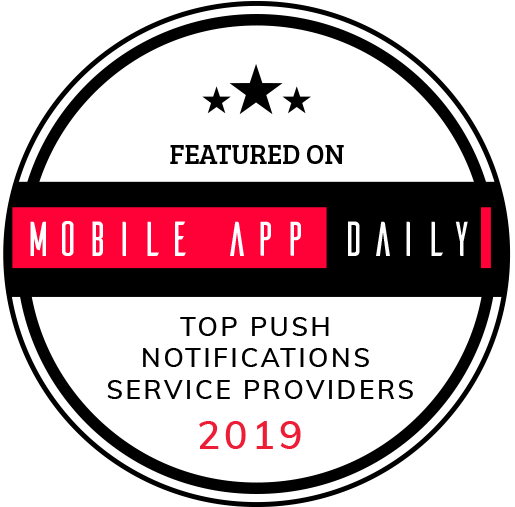 But before we begin with today's report of top push notification service providers, we would like to mention that below-featured services providers are listed in no particular order or at any level of priority. This list is compiled with in-depth research and extreme precision by the team of MobileAppDaily. Vizury is a web-based push notification sending platform that made its debut in the year 2011 with the main objective of focusing on website support. This platform provides a number of services focusing mainly on eCommerce website owners with digital solutions that can improve the overall business performance by re-engaging the website users that have already abandoned the services. For instance, a user once bought a product from a particular website and has now lapsed. So, in order to re-engage the user, you can send some time-sensitive offers and deal with price drop alerts to make the user active on the site again. Pricing: The pricing for Vizury is only available on request. Features: Retargeting Platform, Push Notification CRM Platform, pre-defined Use Cases and primary focus on eCommerce websites. PushEngage is one of the best push notification service platforms that enable marketers to send segmented messages as well as customized messages automatically. This web-based notification sending service has more than integrated by thousands of websites in more than a hundred countries. Leading names like Times Now, AJIO, Harvard Medical Review and Indeed use PushEngage to send push notifications to Web browsers including Firefox, Chrome, Safari, etc.. Features: Cart abandoned Push Notifications, Dynamic segmentation, Advanced Analytics, Automatic responders, A/B Testing and Multi-site support. Platform: Desktop, Android and iOS. As a multi-channel platform for marketing purposes, SendPulse makes sure to deliver an entire array of services to their clients. This array includes services like SMS, bulk emailing, Web notification sending and many more. The aim here is to help marketers in driving huge amounts of the relevant audience towards their websites. This driving of traffic can be done smoothly and efficiently with the help of this push notification service and the alerts sent to the mobile devices and desktop devices of targeted users. Features: API for app developers, segmentation, personalization, easy campaign setup process, flexible pricing, and A/B testing. Platform: Desktop, iOS, Android and Windows Mobile. This US-based notification sending marketing company was formerly known as AppBoy and was founded in the year 2011. The basis on which the idea of the platform came into existence was to help mobile and Web application owners with major issues like app abandonment problems, churning, etc..
Now Braze offers a whole suite of customized services like an advanced user profile system, multi-channel messaging with options like email, News Feed, Push Notifications etc to its top-notch clients. Pricing: The pricing for Braze is only available on request. Features: Intelligent push messages delivery, innovative message personalization, action-based delivery and Xamarin OS support. Platform: Fire OS, iOS, Android, Windows Mobile, Unity, Xamarin, Baidu and Web support. If we are talking about some of the most popular push notification services that OneSignal comes among the leading names as a successful multi-platform notification service organization. The company is trusted by more than 300 thousand web/mobile application developers. And within a span of a few years, OneSignal has created a strong global presence for itself, with some of the biggest tech companies as its clients, for example, Cisco, Slate, LINE, Uber and Adobe. Pricing: The Premium account plan pricing is available on request and apart from this there is another plan i.e. Standard plan, which is free. Features: Unlimited devices & notifications support, A/B testing, Localization, Delivery scheduling, Unlimited segments, Full API, data import and export features. Platform: Android and Web, Xcode, Unity, Marmalade, iOS, Adobe Air, Phonegap, Android Studio, Visual Studio, Titanium, Cocos2d-x, Corona, Xamarin, Ionic, React Native, Intel XDK and Cordova. Founded back in the year 2011, SWRVE has impressively made its way among the top push notification service providers in the United States. With the help of their vast range of services, the company has worked for various companies that are currently leading their respective industry verticals. Their list of clients includes names like Life360, Sony, McAfee, Warner Bros., Electronics Arts and many more. Apart from this, SWRVE also backed up with huge funding. Pricing: The pricing for SWRVE is only available on request. Features: Segmentation capabilities, Push messages personalization, Local Time Push Notification delivery support, Analytics Tools and A/B testing. The Amazon SNS is also known as Amazon Simple Notification Service that made its debut in the year 2010. This notification service was launched by Amazon to help in facilitating the mobile app developers and providing them support in developing mobile applications that are more advanced and sophisticated at the same time. This Simple Notification Service by Amazon is offering simple yet innovative facilities to its clients such as Yelp, Hike, WunderList, Yik Yak, Messenger etc..
Pricing: There are no predefined plans i.e. the delivery of the first million notifications is free and after that the rate changes to $0.50 / million. Features: HIgh-level hardware infrastructure, Simple APIs, easy mobile app integration, multiple transport protocols, flexible message delivery, cost-effective, Web-based AWS Management Console and a point-and-click interface. Platform: Windows Phone, Fire OS, iOS and Android. Batch was launched four years ago in the year 2014 in France, Europe as a platform focusing on mobile application engagement. The company has made a name for itself in the industry by offering high-end push notification services and other app solutions to mobile app developers and their clients. Apart from this, Batch also consists of the native ad monetization component that can be utilized by the end-users without any additional charges or up costs. Features: Frequency-based creation, Automatic users segments, High-speed delivery, User dashboard integration API, Competitors campaign benchmarking and Search Engine for the database. Platform: Android, iOS, Windows Mobile, Unity, Air, Ionic, PhoneGap and Cordova. Accengage is another widely known push notification service provider that has been leading in the market for the past few years. While this message sending platform has been in the limelight for offering tools for both advertisers as well as app publishers, this leads to acquiring potential customers as well as increasing the app engagement at the same time. The platform of Accengage is being used by a large number of international brands like Century 21, Orange, Carrefour, Nestlé, KLM, Condé Nast and Disney. Pricing: The pricing for Accengage is only available on request. Features: Notifications personalization, Automation, A/B Testing, in-app messaging, Mobile retargeting, Analytics Tools, Multi-app messages, Badge management and Social media notifications. Mapp is one of those push notification services that are on their way to bring a revolution with their global marketing technology. Formerly known as Teradata’s Digital Marketing division, the company now offers a number of in-app plugins for app publishers that also allow them to interact with their targeted user base. Some of the facilities it consists are offer wall, customer feedback form, message inbox etc. In addition to that, the mobile push module is also a part of this customer engagement platform. Pricing: The pricing for Mapp is only available on request. Features: Deep linking tech support, Analytics, Geotargeting, Server to server integration and Suggestion tool. This customer messaging platform is a great option to choose for those who are looking for a wide range of options under the same roof. The communication tools of Intercom are specifically built to deal with the different types of business requirements which also includes additional ways to interact with the customers. With the help of the platform, the developers can easily interact with their target user base with options like social media, website, mobile app, emails, SMS etc.. Features: Unlimited Devices & Notifications Support, Auto Message, Segmentation, in-app Messages, Automation and Metrics with goals tracking options. Kumulos is a white-label mobile application performance management platform that offers high-quality push notification services to software as well as Web-based app development companies. This is a platform that primarily focuses on the service of push notifications where the services can be easily customized with respect to a particular company or brand requirements. Pricing: The pricing for Kumulos is only available on request. Features: Scheduling of Push Notification Messages, Effective segment building, various filters & channels, sending background data, Geo-fencing capabilities and options to track results along with Kumulos API. The push notification service company, PushBots made its debut six years ago i.e. back in the year 2012. The main objective of the company is to assist the mobile as well as the web application developers in analyzing their user information and evaluating their potential customers from the lot. The platform also offers developers the options of a light messaging kit that can be plugged in with a single SDK (Software Development Kit) directly to their application on iOS, Android or even Web-based apps. Features: Targeting, Events, A/B Testing, Localization, Smart schedule and Twitter Integration. Platform: Android, iOS and the Web. Even though FoxPush was founded just two years ago in 2016, it has managed to quickly make its way among the top push notification service providers in Australia. The company provides support for various platforms such as tablets, desktops, smartphones etc. hence, delivering digital solutions to millions of people. There are both free as well as paid plans available at FoxPush, and these plans can be further customized as per the preferences of the app developers and clients. Pricing: The pricing for FoxPlus is only available on request. Features: Sophisticated Messaging, Instant Delivery, Multi-Device Support, Multiple-browser support, Emoji Supported, Advanced User Targeting, Demographic Targeting, Segmentation and Instant Subscribers Reports. Platform: Android, iOS, Desktop and Windows Mobile. Taplytics allows their clients to engage with their audience by delivering a personalized 1-to-1 mobile experience with the help of innovative push notification services. They believe that push notifications are most effective when optimized with content that is relevant to their user base. This notification sending platform offers a ton of features to their clients and some of them are optimized personalization and metric reports to measure and then evaluate the overall user activity taking place on the application. Pricing: The pricing for Taplytics is only available on request. Features: Automated Messaging, Geolocation Support, A/B Testing, Demo account, Advanced Analytics, Transactional Push API and innovative segmentation. And these were some of the best push notification service providers that provide excellent push notification services to their clients from across the world. Aside from this, we would also like to state that the above-mentioned list has been curated only after our team connected with various clients that have worked with different push notification services and gather their feedback about their experience working with them. We honestly hope that with the help of this list 'Top Push Notification Service Providers 2019' you will get some better insights on what to look when it comes to a push notification app for your next big project. In addition to this, if you have any queries related to app push notifications or any other push notification that is worth mentioning, feel free to connect with us and we will get back to you as soon as possible.